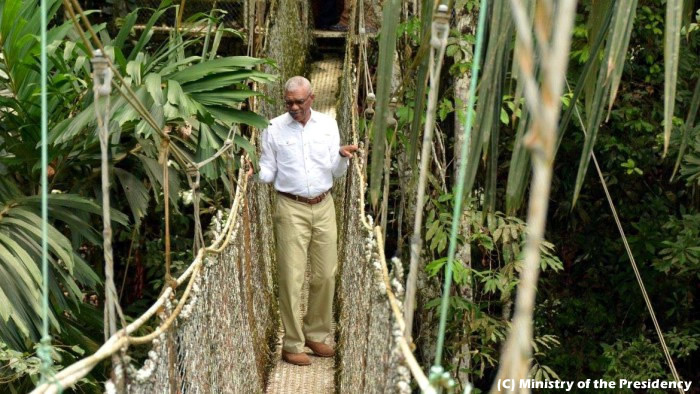 His Excellency Brigadier David Granger, MSS, President of the Cooperative Republic of Guyana and first Lady Sandra Granger visited Iwokrama in June and was the first President to overnight at the River Lodge. He landed at the newly rehabilitated airstrip at Surama where they were warmly greeted by Minister of Indigenous Peoples’ Affairs, Sydney Allicock and residents of Surama Village. Speaking to a gathering at the Surama Village Office, the President reaffirmed his Administration’s commitment to sustaining Iwokrama and ensuring that it becomes a workable model for development and environmental protection. 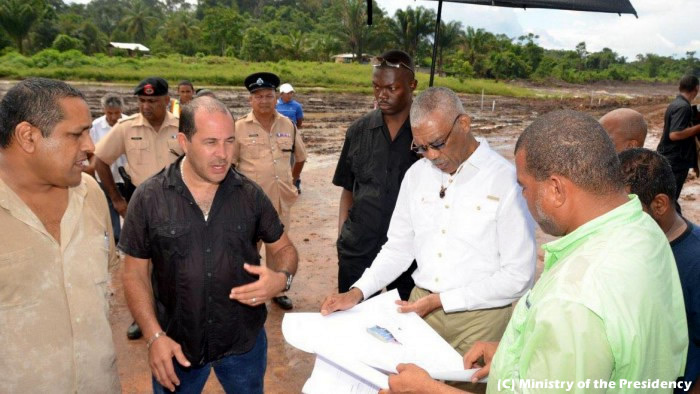 “We cannot develop this country unless we learn the lesson of Iwokrama; the lesson of biodiversity, sustainable development, renewable energy, climate change and living together, not in conflict, but in concert with nature… Unless we solve these problems, Guyana will continue to be poor,” President Granger said. 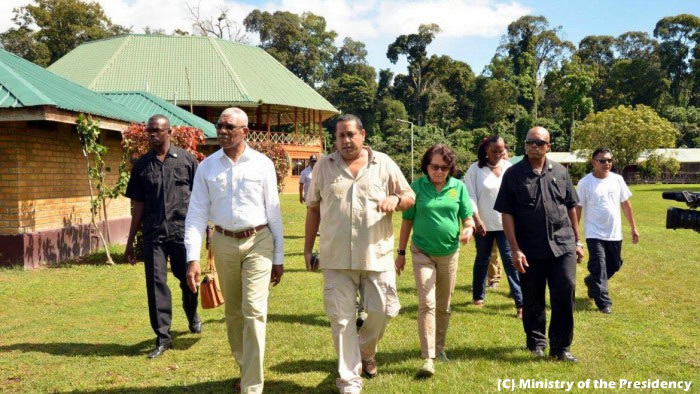 The President then made an on-site spot check on his way to the River Lodge and Research Centre. The President vision is for Fair View airstrip to become a hub for flights to and from Iwokrama. The airstrip has extended to 4200 feet to facilitate larger aircrafts and cater for increased air traffic. This improved infrastructure will also allow for faster and easier access to the Centre, particularly to Guyanese and Caribbean students, as well as tourists and researchers from around the world. The Head of State explained that his vision for Iwokrama is for it to become, largely, a centre for education in biodiversity and conservation for Guyanese and the Caribbean Region. “It is a huge area of 371 square kilometres and there is room for a variety of activities and my emphasis will be on biodiversity, botany, zoology and focusing on protecting our flora and fauna and preserving our wildlife… We want to see this as part of the education system,” the President said.